The Fellowship was fortunate enough to obtain a copy of ACTIONVERSE FEATURING STRAY #1 from Action Lab Entertainment. The story is by Vito Delsante; with art by Sean Izakse & Lee Gaston, colors by Chris O’Halloran & Wilson Ramos Jr., and letters by Full Court Press. 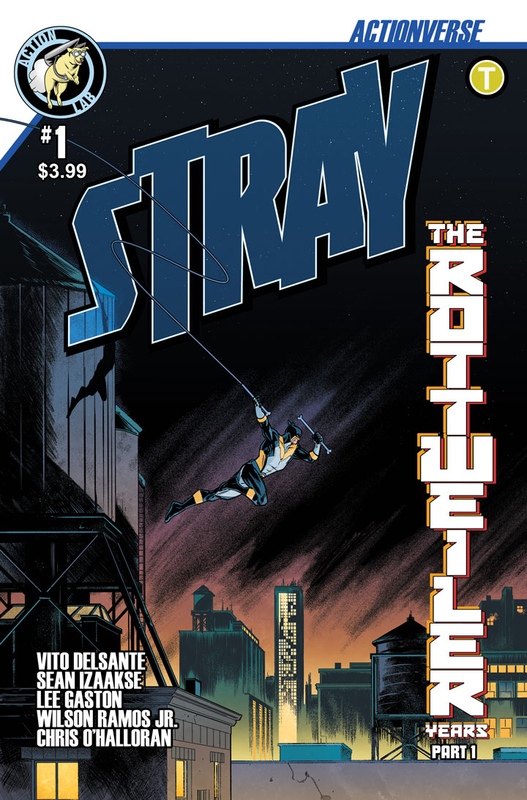 Rodney Weller is back on the streets as the crime fighter The Stray. He is out investing a series of cop-shootings which leads him to an encounter with the suspect. The gunman drops a hint that makes Rodney realize they know each other. After the suspect gets away, The Stray remembers the early days of his team The Teen Aegis. But who is this person? Why are they killing? Does this have anything to do with the first mission on the group of superhero teens? With STRAY Delsante captures the fun and adventure of yesterday’s superheroes, but with a modern twist. Teen sidekicks want to have some fun, be around others there age, and most importantly try to get out of their mentor’s shadow. Delsante accomplishes so much, intro of characters, setting up a mystery, and doing it in a pace that doesn’t feel rushed. Izakse’s art handles the harsh reality of the present; Gaston does the flashback which gives a simpler time feel. The book has a great look, aided by O’Halloran & Ramos Jr. colors. Check this book out, you won’t regret it. And if you agree, you should also get THE STRAY and ACTIONVERSE trades. ACTIONVERSE FEATURING STRAY #1 is in stores now or available at www.actionlabcomics.com.